Our look at different types of food starts with Nicaraguan food; an undiscovered delight! More and more restaurants and Chefs are looking to broaden their experience and offerings to more concerning and traveled guests. Here is where we will spotlight unique food areas that are often overlooked like this spotlight on Nicaraguan style food. The food in Nicaragua is similar to Mexican food but it certainly has its own flair. Dishes such as, Nacatamales (smashed corn and potatoes wrapped in a banana leaf along with some pork meat, little fresh tomato) is the most typical example of their cusine. Gallopinto, which is fried rice and pinto beans, is also a delicious regional dish and is a daily staple for the people ( see recipe below). Other special dishes include Mondongo (tripe soup), Rosquillas (a type of cheese and cornmeal biscuit), Picadillo (shredded beef) and Ajiaco (pork and tortilla dish) to name a few. Plantain is also often used in many dishes with fried plantain being a staple. Tortillas are a normal addition as well, and often used to scoop up the food instead of using utensils. Corn is a used frequently and you can always find it roasted and served throughout the countries by street vendors. Nicaragua is a lush and tropical place with abundant marine areas so it is not surprising to see the use of the freshest ingredients in Nicaraguan food. 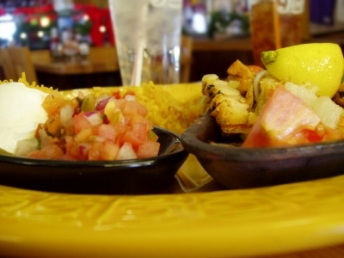 You can expect the use of many of the local fruits in their salsas, and as toppings on a variety of fresh fish dishes.